Hey guys, I’d like to post this presentation that I worked on recently. 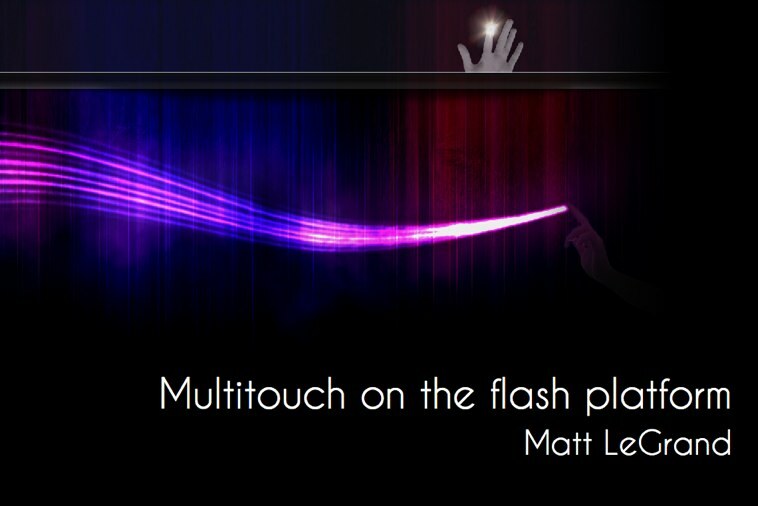 I think it’ll be a great jumping off point for people that aren’t familiar with the new multitouch capabilities in Flash. It’s mostly just me talking through my slides but the presentation uses an Adobe Air application that I cooked up. The application uses multitouch by connecting to my iPhone over a UDP socket connection. Fun stuff. I’d also recommend people go back and check out some of the first multitouch tutorials I did where we trace out some of the new touch events as well as the new transform gesture events. This entry was posted on Friday, March 5th, 2010 at 4:12 am and is filed under Tutorials. You can follow any responses to this entry through the RSS 2.0 feed. You can leave a response, or trackback from your own site. I’ve changed the link to point to github. Earlier I had referenced another presentation that I can’t seem to find currently.